One of the most exciting parts for me about my recent visit with Janet Clarkson in Brisbane was our trip to the local farmers’ market. Brisbane, being in the southern part of the state of Queensland, is sub-tropical, but much of the rest of the state lies squarely in the tropics which means, exotic fruits at the farmers’ market! In Brooklyn, there is no way we will ever see some of these things offered for sale by our local farmers, so it was lots of fun to browse. 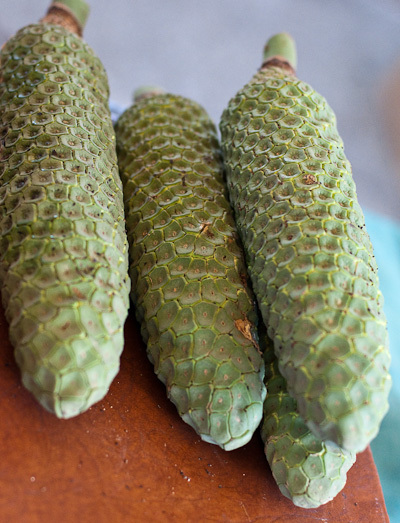 This strange looking specimen is Monstera Deliciosa also known as “fruit salad plant.” To eat, you gently remove the scaly looking skin and eat the white pulp beneath. It tastes like a combination of pineapples and bananas, sort of tutti frutti. 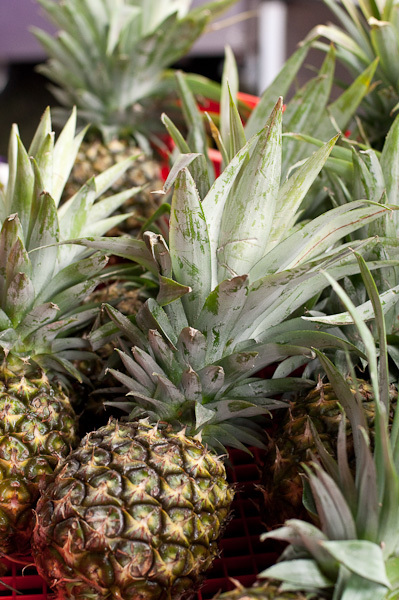 The pineapples I had in Brisbane were incredibly fresh, with a subtle vanilla undertone. 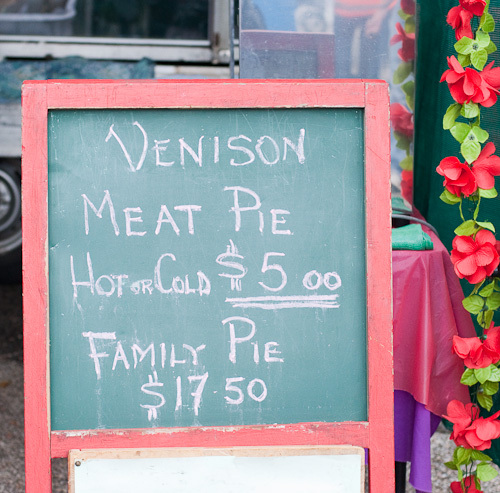 There were many different varieties available at the farmers’ market. I wish I could have tried them all. 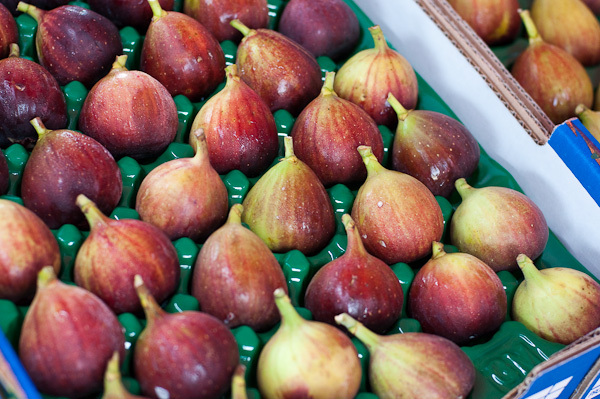 Here are some luscious, purply, fresh figs, just waiting to be eaten. 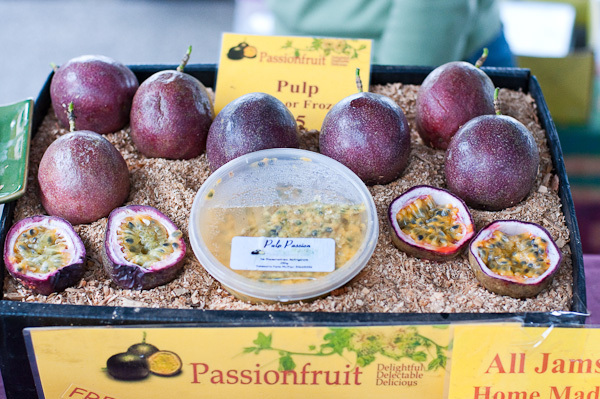 Passion fruit grows like a weed in much of Australia, even further south in Sydney where it is not nearly as warm as Brisbane. My Australian husband misses having it around, so when I saw some in a green grocer’s shop in Brooklyn I bought a few as a surprise. They cost me $3 each. In Brisbane, Janet bought a whole bag for the same price. Finally, a nod to Australia’s British heritage.